Posted in: Art, Music, Photography. Tagged: 1929., Dan Fogelberg, Deauville Racetrack, French, Nelson-Atkins Museum of Art, Oil on canvas, Raoul Dufy, Run For The Roses. 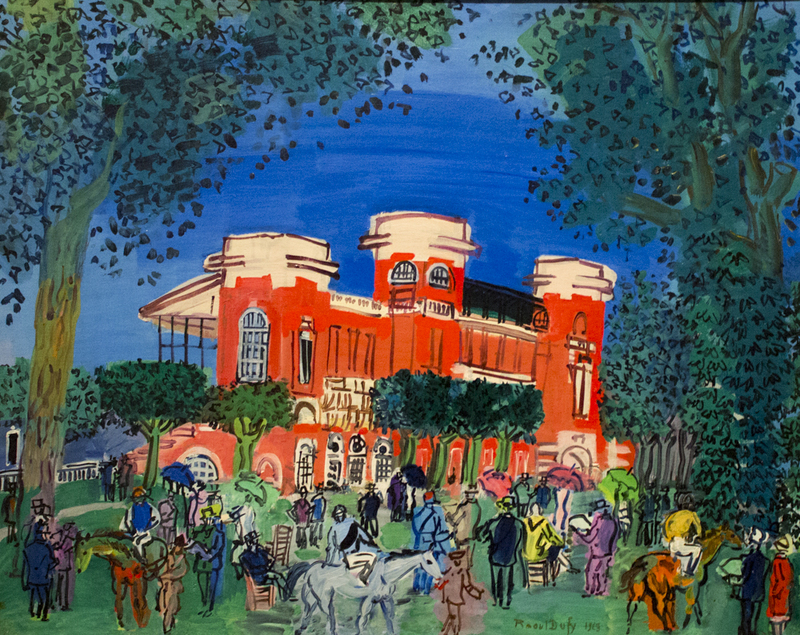 In cheerful colors and quickly sketched figures, Raoul Dufy captured the lively spirit of the Deauville Racetrack. Jockeys atop sleek horses meander through the crowd of fashionably dressed men and women enjoying a perfect day in the park behind the track. Located in Normandy, on the northwest coast of France, the delightful beachside Deauville attracted wealthy visitors. Easy train travel from Paris made it a readily accessed destination. I assume it is no accident that you posted this today (6/9/2018), the day of the 150th Belmont Stake and a chance to to see a Triple Crown winner for the first time in 40 years. Wonderful painting, and a lovely moment’s glimpse from long ago. I love this , the colors are gorgeous, it has for me a rather oriental atmosphere though I recognize is isn’t. Yheuscrdmimds mevghe Triple Crown is today. Can’t wait. Thanks for the beautiful artwork. this is such a delightful painting.